Seoul’s public transportation pass (PTP) system, which allows passengers to travel between Seoul and Gyeonggi Province using all types of public transportation, has been recently named the world’s best public transportation system, and continues to spread around the world. As such, the heads of local governments and transit authorities of over 80 countries worldwide have visited Seoul to benchmark its PTP system. The unprecedented reach of the PTP system throughout the transportation infrastructure, the accuracy and speed of its data processing system, and the unsurpassable quality of the service management have made Seoul’s PTP system an object of admiration and import for policymakers and businesspeople worldwide. Citizens in Seoul can access the system anywhere in Seoul and Gyeonggi-do using a single smart PTP card, which automatically adjusts the transit fares and provides discounts on transfers, allowing citizens to commute and travel in and around the nation’s capital region with ease. The remarkable convenience and expediency of Seoul’s much-praised public transportation system have been largely achieved through the Seoul Transport Operation and Information System (TOPIS). TOPIS gathers a comprehensive range of data from a variety of sources, including the Bus Management Service, PTP system, unmanned fare collection system, transportation broadcasting system, the police, and KoRoad, in order to oversee and manage all conditions of transportation in Seoul. By visiting the TOPIS website, one can check the current traffic status, road congestion, locations of nearby parking lots, and other on-road events and emergencies. The website also provides information for those riding buses, the subway, and bicycles, along with maps and sky and road views. Seoul also offers other diverse services for public transportation users. For example, “Subway Navigation” and “Seoul Bus” are smartphone applications that show the estimated arrival times, intervals, and nearby stations or stops for subways and buses. The subway stations and major bus stops in Seoul are also equipped with digital displays that provide users with the estimated arrival times of subways and buses. Users can access and use the incredibly convenient, systematic, and punctual public transportation services in Seoul with only a single public transportation pass. In fact, Tmoney can be used on all types of public transportation nationwide, including public buses, subway systems, trains, and intercity coach services. 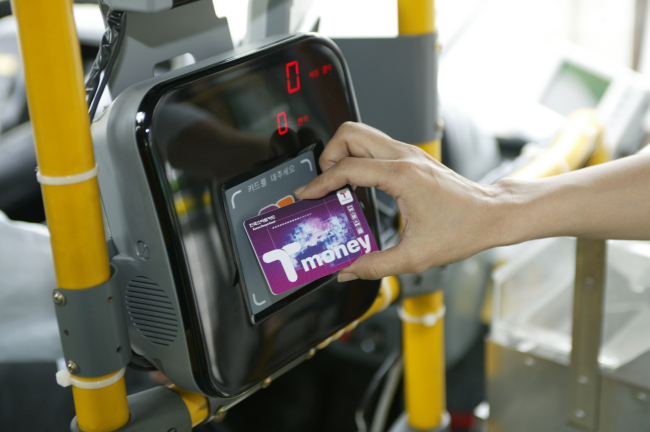 In Seoul, swiping your Tmoney card when transferring between the subway and a bus incurs no extra transportation charge. The automated fare collection (AFC) system automatically adjusts the amount of fare to be deducted from your card according to the distance traveled. Tmoney is also quickly evolving into a means of executing small financial transactions, with users charging their T-Money cards to pay for goods and services at convenience stores, discount markets, and fast food restaurants. Use Tmoney to ride buses and subways in Seoul and Gyeonggi Province, and some of the fares you pay with it will earn you T-mileage points. Anyone who visits Seoul, whether Korean or not, can purchase Tmoney and Mpass. Seoul is striving to maximize the convenience and safety of its public transportation services for all citizens. In particular, a woman taking a taxi home late at night can now swipe her smartphone across the near-field communication (NFC) tag on the back of the passenger seat headrest to transmit information on the taxi’s number, time and location at which she entered the taxi, and other types of information to a designated guardian. Also, the Subway Safety Guard is a smartphone application that uses the WiFi network to instantly report crimes that occur on subway cars to the police. Furthermore, women can now feel safer walking home from bus stops late at night. Seoul has designated about 600 convenience stores throughout the city as “Safe Havens for Women,” to which women may flee if they are chased by predators or abusive partners. Seoul also provides the “Safe Return Home Service,” through which two or three volunteering “scouts” accompany each woman home late at night upon the woman’s request. Seoul continues to implement its long-term plan to improve the convenience, safety, and user-friendliness of its transportation and traffic services through various initiatives, such the development of pedestrian-friendly roads and an increase in the number of low-floor public buses, among others.